Mia Farrow (born Maria de Lourdes Villiers Farrow; February 9, 1945) is an American singer, actress and humanitarian worker. She has won many awards, including a Golden Globe. She has been in almost 50 movies. 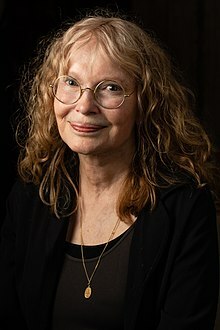 Farrow is also known for her extensive humanitarian work. Time magazine named Farrow one of the most influential people in the world. She gained further recognition for her subsequent short-lived marriage to Frank Sinatra. She later married André Previn after she became pregnant with his child. She dated Woody Allen. Farrow's first main role in a movie was as Rosemary Woodhouse in Rosemary's Baby and starred in the television series Peyton Place. It was released in 1968. She won several awards for it. She became the first American actress to join the Royal Shakespeare Company. In the 1980s and early 1990s Farrow acted in nearly all of the movies released by her boyfriend Woody Allen. She last acted in the 2011 movie Dark Horse. Farrow married singer Frank Sinatra on July 19, 1966. He divorced Farrow in 1969. In 1980 Farrow started dating Woody Allen. In 1992 Farrow found naked pictures of her adopted daughter Soon-Yi Previn in Allen's house. Farrow and Allen broke up after this. She has thirteen living children and nine grandchildren. Two of her daughters have died. Farrow has seven adopted children. In 2014, Dylan Farrow wrote an open letter in the New York Times, saying that her adoptive father Woody Allen had sexually abused her when she was a child. Allen wrote a response in which he quoted Moses Farrow, “My mother drummed it into me to hate my father for tearing apart the family and sexually molesting my sister." ↑ Farrow, Mia (23 January 2013). "Setting the Record (and the Hair) Straight" – via NYTimes.com. ↑ "A Family Affair". PEOPLE.com. ↑ Allen, Woody (7 February 2014). "Opinion - Woody Allen Speaks Out" – via NYTimes.com. This page was last changed on 14 February 2019, at 13:12.